If you are in the process of repairing a Crumar Organizer yourself the first thing you should get is probably the crumar organizer repair manual. You can check here and here. 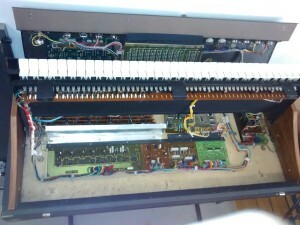 Searching online will probably reveal a few more hits of the repair manual and schematics. The first thing to be checked was the power supply. The power supply of the organ seems to have been repaired a few times already as the element were most definitely not the original ones. The replaced elements were of the Iskra company / brand (once a quite strong standing Slovenian / Yugoslavian electronic component producer). Even the original components might have been from Iskra – the old NOS (new old stock) components are still quite sought after for the repairs of old audio equipment, but the ones in the circuit didn’t even fit the circuit board. 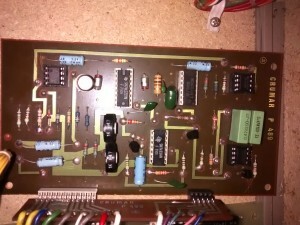 The big regulation capacitors were replaced and also the diode bridge. If we wanted to do a full refurbishment, probably all the electrolytic and tantalum capacitors on all circuits should be swapped with a brand new ones. The power supply is through some fuses and regulators, so there is not really much that can go wrong, even if the output is short-circuited. When we first got the organ the fuses had been wrapped in aluminum foil to conduct. This is not a good practice unless you don’t mind burning your house down… The blown fuses were replaced with brand new ones and the foil was removed. Also using proper fusing when doing repairs may save your device at the expense of a few blown fuses. Next one should probably check all the power supply nodes on at least a few points on each printed circuit board. We have only checked the voltages on the inputs of the PCBs which made us miss a few errors and spend some more time on finding them. For some reason after powering up the organ for a few times and testing different keystrokes the power supply output got shorted. The fuses didn’t blow but the regulators got quite hot. The error was tracked down to a few capacitors failing in the keyboard debounce section. They were replaced with new electrolytic capacitors (no need for tantalum). Also a diode had to be replaced on the same board. You can test this board with a normal conductivity tester. Failed capacitors are either shorted or conduct partially (measure as a resistance). Failed diode will conduct in both directions or less often become a open connection. 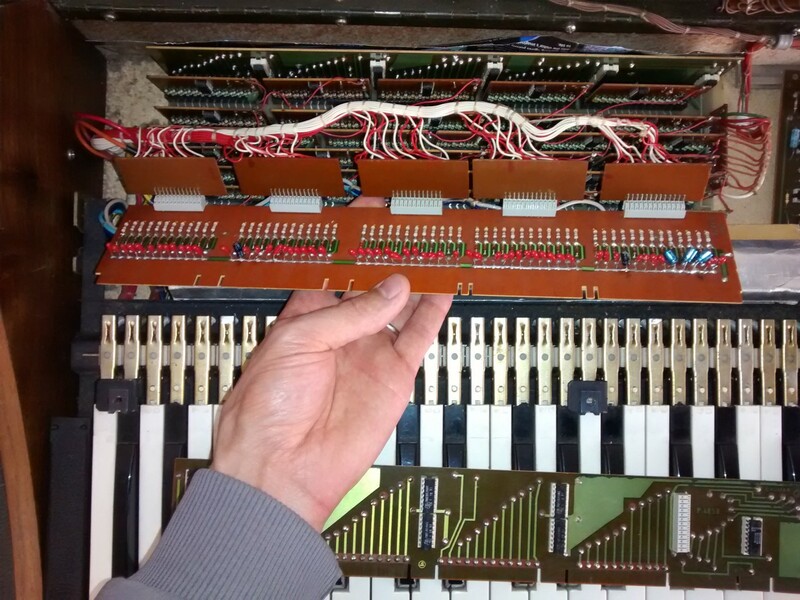 After this fix the organ powered up again and also a few keys that were previously dead started working again. The amplifiers and filters board seemed to be ok, but some of the plastic capacitor housings were cracked. These would probably also need replacement if the organ were to be fully refurbished. These boards worked just ok, so we let them be. It’s a bit more tricky to measure the signals here as most of the amplifiers are set up as a current-controlled, which means that if everything is ok there should be no voltage change even if there is a signal present. Also some of the tones / flutes did not work. You can find out which ones by turning off all flute bars but one and then trying all the keys. Repeat for each flute bar. The tones in Crumar are generated by a note tone frequency generator chip which generates the top octave and are then divided by 2 multiple times to get all the lower octaves. 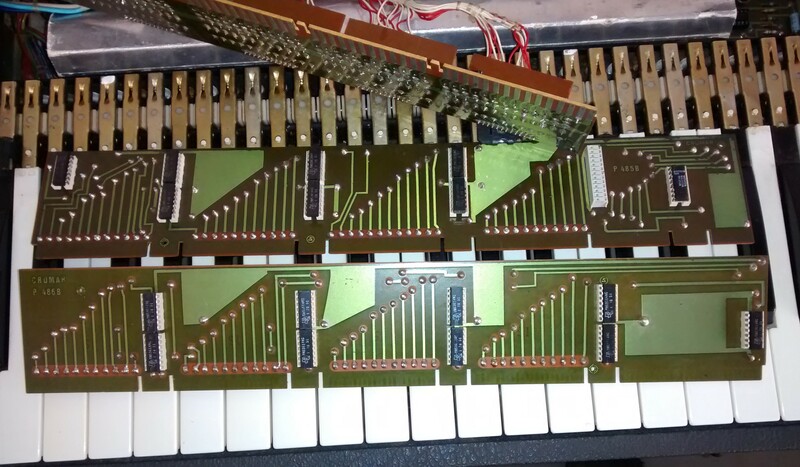 Luckily the main tone generator chip was ok, but one of the divider chips was only partly working. As the damaged divider chip was quite high in the frequency division chain all the tones that got divided from it were missing. The nonworking/partly working chip was exchanged with one of the good chips at the end of the chain (at the lowest tones). This way only a three lowest flute harmonics were missing, which are not used anyway if you enable the bass section of the organ. After leaving it for some time and then powering the organ again it became apparent that we haven’t fixed the high pitch problem which fixes automatically after the board warms up. The frequency shift and the fact that the ptich shifting along with the vibrato did not wrong indicated that something was wrong on the main oscillator board. 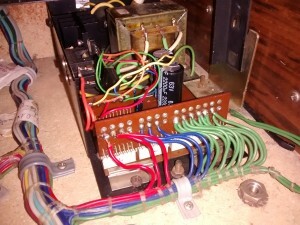 It proved to be a broken connection in the negative power supply of the board. You should be careful as there are some mistakes in the repair manual / schematics. Negative power supply is not shown and some negative supply connections are mis-drawn as a ground connection. The problem was with “vias” connecting the upper and the bottom side of the board. The PCB manufacturing process has come quite a long way from the times the Crumars were made 🙂 When soldering the PCB it offgasses heavily, which probably causes bad solder joints. It is also interesting that only very few boards in the instrument are made with metalised holes. 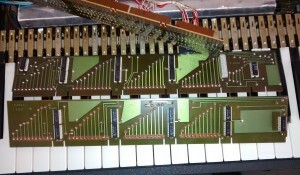 Many of the boards use springs which are also used as contacts in instruments keyboard for connecting the two copper layers. I’ve completed a repair of T1 Organizer last week. there were some capacitors faulty – causing short circ in power supple section on resonance section. Easy to repair if you know how analogue organs work. I had an issue with obtaining blown CA3080, CD4016 IC’s. But finally got it. Now I’m about to restore the case which is not damaged but can look better. 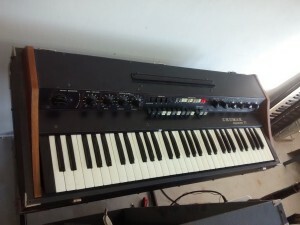 I have a Crumar T-2 in need of repair . Presets work fine but the drawbars completely quit. Where would I have to ship it to in order for you to fix it? Unfortunately I don’t do repairs for money, just for fun 🙂 I suggest you to try to find someone locally who has a good knowledge of electronics (and preferrably has done some analog organ repair work previously). Probably the first thing to check would be the wiring to the drawbars and the low side switch U12 on P497 board (test points 41-51). PS: If you are from Slovenia or from somewhere near you could bring the Crumar and we could have a look. I’m a technician at a large machine shop with CNC controls on them and my background was circuit board repair. 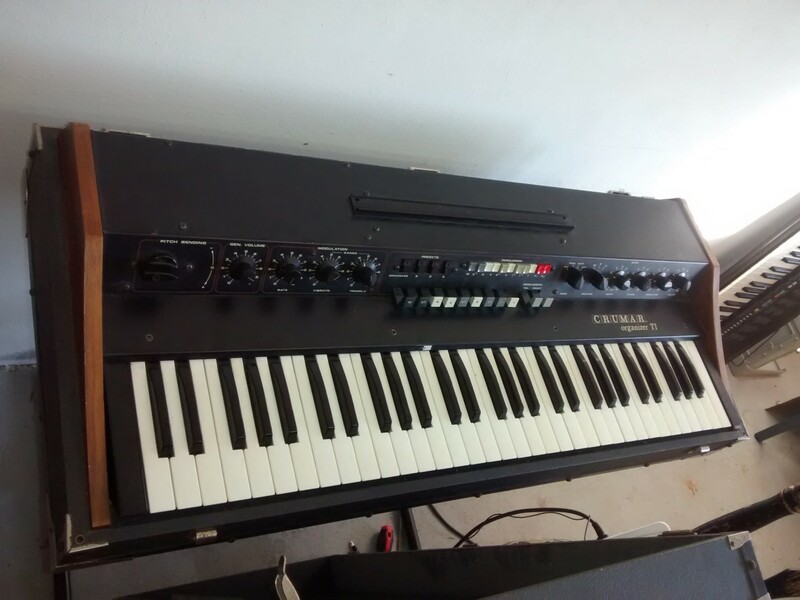 So recently I acquired a Crumar T1 unit and found that it was not working. So I downloaded manuals and schematics. The Poor scans of the original was so bad that it was unreadable for some of the boards. So after replacing the small cap that normally short out, also a new power supply with appropriate fuses. I proceeded to reverse engineer the circuits. I have the entire unit now with all the connection and the color code of wires and names. Doing this made me appreciate the new idea that Crumar was trying at that time with the new IC chip technology. 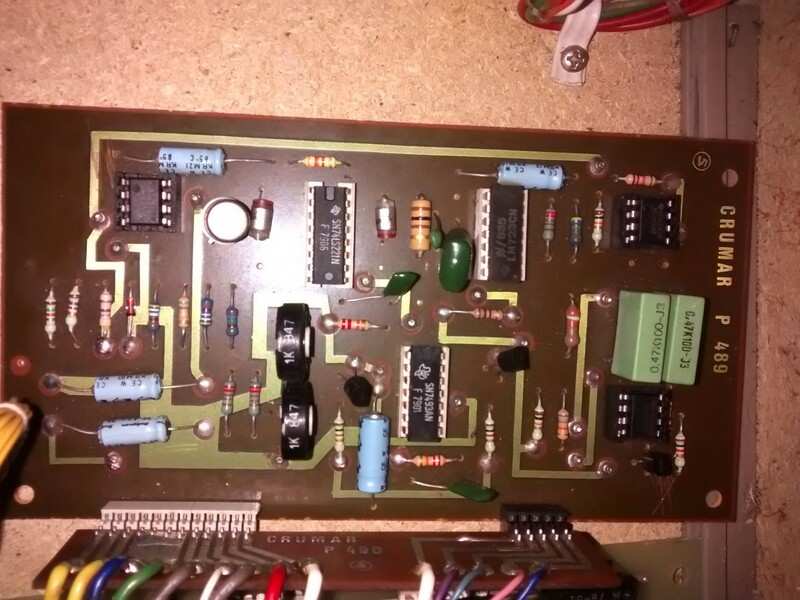 Hi everyone, Im currently restoring a Crumar T2, the thing was dead on arrival, after rebuilding the psu the thing now powers up and 90% works although theres a few niggly things im having problems with…any chance I could bend someones ear whos in the know about the T2? 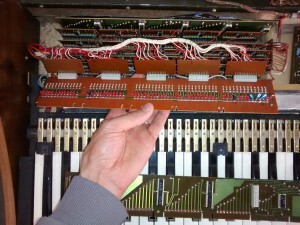 1 Pings/Trackbacks for "Repairing Crumar Organizer electronic organ"